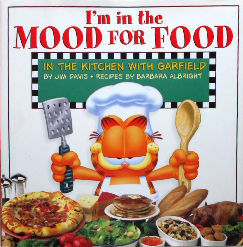 This Garfield cookbook has sections on salads, grilling, pasta, vegetables, pizza, snacks and treats. Garfield says he is the "Gulping Gourmet'. As he says: Home is where the stove is. This hardback book is 8 1/4" square. Colored Garfield illustration with each recipe. Copyright 2003, 127 pages. Previously owned but in good condition. Note; This book weighs 1 1/2 pounds.